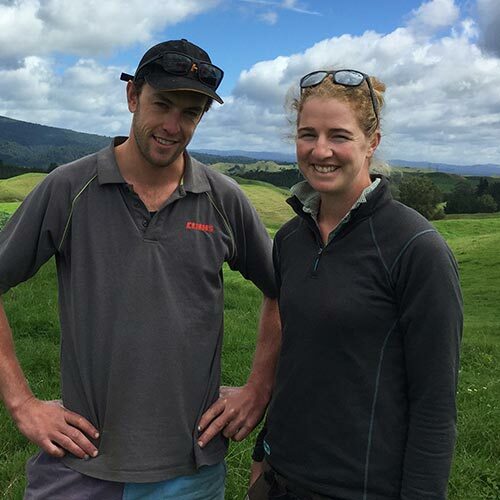 A hilly farm and a desire to be challenged were the main drivers for Brett Steeghs and partner Ruth Hone joining DairyNZ’s Tiller Talk programme. The couple have been 50: 50 sharemilkers on a Mangakino farm for two seasons and are keen to be in the top 10 percent for farm working expenses and for pasture harvested. To get there they must combat some challenging topography with 50 percent of the farm hill country, with an altitude of 500m. “It’s always a compromise between the ‘camping spots’ which grow a lot and the slow growth in the sidlings on the same paddock,” says Brett. Brett feels they could capture more of the whole growth potential and would welcome advice around managing these pastures. The couple both enjoy learning. Ruth, who earned an agricultural degree from Massey University, is from a dairy farming family while Brett is a former mechanic who is now into his third season. In his first season he won the 2015 Waikato Dairy Trainee of the Year title. Pasture management is already top of mind for everyone on farm. Brett and Ruth, along with William Downs (another full time staff member), each do a weekly pasture walk on a section of the farm. “We go hard on residuals and make it a priority to keep on the top of it in spring so paddocks are well set for the rest of the season – it’s all about quality of feed offered”.